After a life globetrotting with his owner Lavinia von Schneider, Albi the Staffordshire (right) is a permanent fixture of Brackenbury Village. 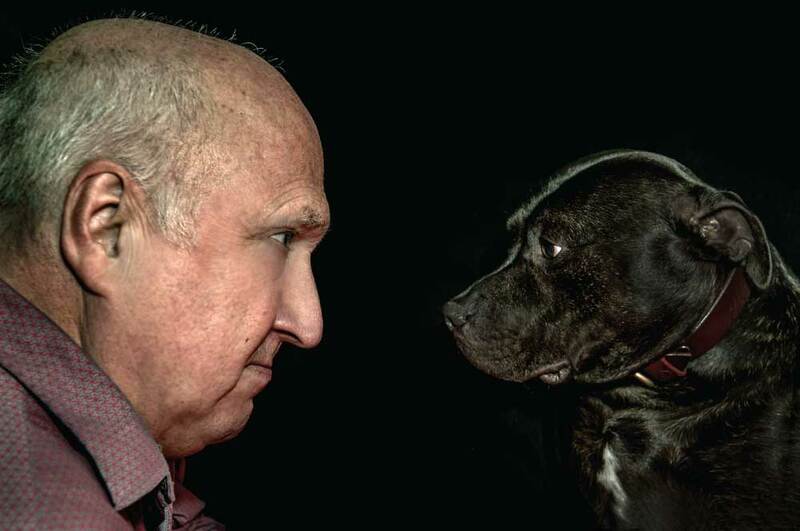 Reporter Rufus Barclay (left) goes face-to-face with this popular and influential resident. Q. You knew the Prince of Wales quite well, tell me about that? It was nothing, we were in the JFK compound and I could see he really wouldn’t do. Lack of fibre. No way that chap would stay the course – I knew. But I spotted a neat looking Cavachon, then she started yapping, ‘Leave that pooch alone, Mimi’. A stringbag if you ask me, and suddenly we were tangled up on the sofa: Wallis, Edward, MiMi, me. The constitutional issues were rather boring. But I liked her feet. Q. Did you stay often at the Kennedy’s? Q. Where else did you go with von S? I won’t speak of her heartbreak years. Traipsing from one faded royal court to another in the wastes of Outer Diptheria may sound amusing, but, dullsville or what! I have no idea what MI6 were paying her for. Even peddaling her London Taxi Cab for tourists on the Oregon Trail was more fun, and we were short on fares, and they tasted pretty samey. Don’t even ask. We taught him how to tweet after they met in an intriguing Slovenian medical facility. Or garage. It did robot-refurbishment. There was this model called the Melania saying ‘my man he haf short attention span’ on a loop, the solution was obvious. Q. Did you know West Side Story was based on the gang rivalry between the Andover Arms and the Anglesea? I was there, man. All started with the one affair, a couple of young lovers in rival pub-strips prancing down Cardross Street – and then, bam, gangfights! With more mayhem when the massed W6 trans-gender set joined in! Shakespeare didn’t have to contend with that – otherwise one would simply never get out of the theatre. Do you have a light?